Tonight, Top Chef Duels debuts on Bravo at 10 p.m. ET. Focusing on two chefs facing off in each episode, the latest competition will settle dream battles from seasons past. First up: Richard Blais versus Marcel Vigneron in a hamburger face-off. Hamburger trends come and go, with many restaurants serving multiple styles from Wagyu beef to veggie versions (like Blais’s fantastically meaty mushroom burgers). But what stays is the pile of fried pleasure that comes with your order. To fête the TC series premiere, we’re taking on some food battles of our own. Here, we attempt to answer the generations-old question posed at fast-food counters, neighborhood joints and brewpubs. Do you want fries or onion rings? 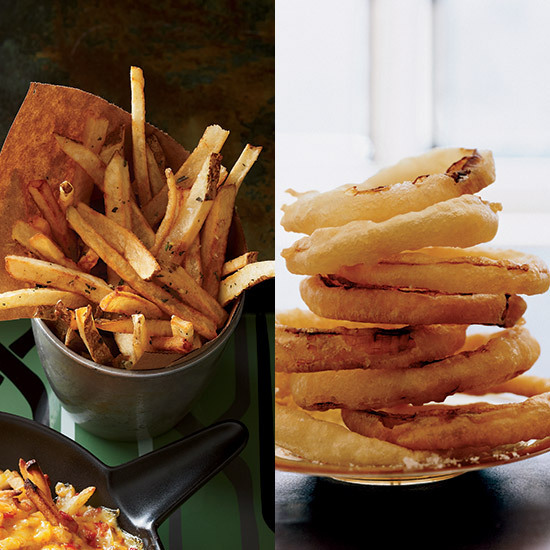 We’ve broken it down in eight categories, to try to select a deep-fried champion. Arguing on behalf of fries is potato enthusiast Noah Kaufman, and in the onion corner is Justine “Better Put a Ring on It” Sterling. May the best dish win. NK: Matchsticks, crinkle cut, waffle fries, steak fries, sweet potato (they count! ), curly fries. There are even alphabet fries so our kids can learn how to spell high cholesterol while they’re getting it. Take all those styles and cook them in different fats and you double the fun. Duck fat and potatoes are best friends. How many kinds of onion rings are there? One? If you’re the monogamous sort, you can go with onion rings. But if you’re an adventurer who can’t be tamed, you want fries all the way. JS: Actually, Mr. Fry Guy, there are at least three types of onion rings: Big and thick (more than an inch in height), medium thickness (half inch to an inch ) and onion strings—which if you’re lucky will come frizzled and packed in a loaf. You’ll never see more than one type of onion ring at any eating establishment. And that’s just fine. Isn’t it nice to have one constant in this crazy mixed up world of ours? NK: Fries are everywhere. From McDonald’s to bougie French restaurants, any restaurant that wants to do decent business serves them. And fries are always cheaper than onion rings. That lower price makes them accessible to a greater percentage of the public. Specifically, the percentage of the public that doesn’t have an extra quarter. JS: Onion rings aren’t everywhere and that rarity makes them more desirable. They’re not available at McDonald’s, In-N-Out or Wendy’s. But you can get them at Burger King and Carl’s Jr. and Sonic. Onion rings are only for those with discerning taste in fast food. NK: All right, fries are not a low-carb, low-fat food. I know that. But potatoes do have more potassium than bananas and can provide almost half of your daily requirement of vitamin C. Now, pay no attention to that giant vat of oil soak. I said, look away. Next question. JS: There’s onion in an onion ring. That’s a potent allium with vitamins like C and B6 and folic acid. They could potentially contain anti-inflammatory, anticancer and antioxidant properties! In short, the interior onion could negate the negative potential of the exterior ring. Don’t quote me on that, but it’s the perfect junk food. NK: I can’t sit here and write in good conscience that all fries are delicious. There are some soggy ones that I wouldn’t feed to my dogs. But this duel should be about the platonic ideals of both fries and onion rings. When fries are at their best they are light, airy, crisp. They are also the perfect canvas for any and all condiments from ketchup to aioli. JS: Fries are a blank canvas. Sweet onion; crispy, fried coating, an onion ring is a symphony of flavors. You don’t even need to dip it. A french fry on its own? Nothing but oil flavor. Take away french fry­–eaters’ ketchup and barbecue sauce and meat juices, and they might as well be eating the cardboard carton the fries came in. JS: A big onion ring is the perfect size to top a burger. It can also be worn as a bracelet for on-the-go snacking. Accessory and cancer-stopping wonder food in one. Boom. NK: They fit nicely into any dipping sauce container. Try stuffing an onion ring in a tiny plastic box of ketchup. More importantly, fries maintain their structural integrity all the way through a meal. If I had a nickel for every time I bit into an onion ring only to have the onion fall out leaving me with a sad, empty, fried shell, I would have dozens and dozens of dollars. JS: No, a big onion ring is not going to fit into a tiny tub of ketchup. But there’s a simple fix for that: Just pour the ketchup onto the ring, a plate or wax paper wrapper. Problem solved. NK: “If I get fries will you split them?” It is in no way an exaggeration to say that question is asked literally every day, at every pub in the entire world. The reason is because fries are perfectly shareable. They come in a huge pile that at least four people can put their hands into at once. If they were any easier to share they would be a cat GIF. JS: Shoestrings and loafs are just as easy to share as fries. The medium thickness rings require some consideration and math skills (would it kill you to exercise your mind a little while snacking??). The big ones are not for sharing. That’s the point, even if one slips into your stack of fries, it’s all for you! They’re the perfect food for the only child. NK: Fries are meant to be eaten when they are served. They shouldn’t be reheated, they shouldn’t wait on the tray while you finish your burger. As a result, I exercise my Fifth Amendment food rights when it comes to answering the question of which is more durable. JS: Thanks to the crisp onion inside an onion ring, the rings are still good even if they aren’t straight out of the fryer. While the outer coating may soften up, the inner onion will satisfy your textural needs. Try getting french fries to-go. They transform into wimpy, soggy, oily, mushy sticks. They should come with a warning label: Do not eat after five minutes. We’re clearly at an impasse. Let us know who won in the comments below or tweet us with #FWxDuels on Twitter.